Democratic presidential candidate Hillary Clinton speaks at a campaign event Monday in New York. There was a single thread running through Hillary Clinton’s big economics speech on Monday: the importance of raising wages for working Americans. 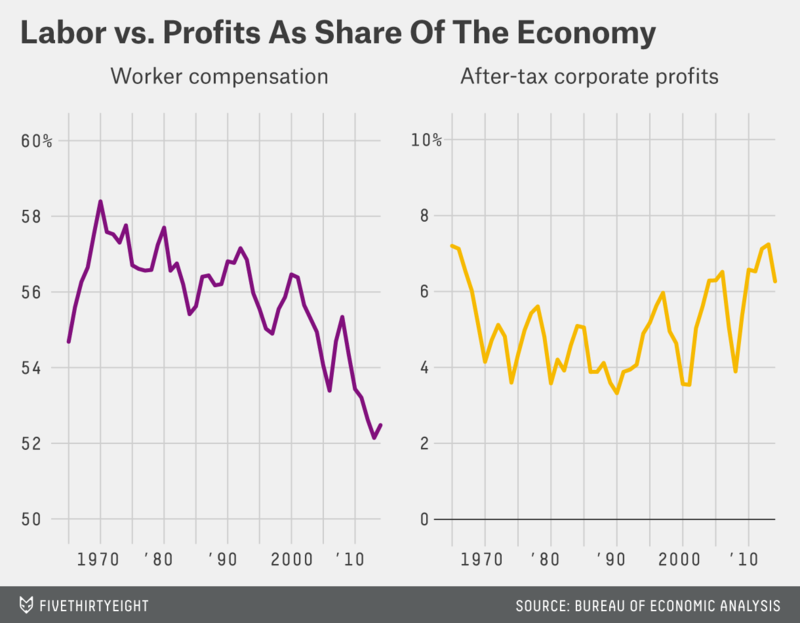 That’s no coincidence: The six-year-old economic recovery has succeeded in restoring corporate profits and creating jobs, but it hasn’t brought pay raises for many workers. Wage growth is running ahead of inflation, but it remains low and hasn’t accelerated as the economy as a whole has improved. And as Clinton stressed throughout her speech, many of those problems predate the recession, suggesting deeper structural challenges in the U.S. economy. Clinton’s speech was light on specific proposals — those will arrive in coming weeks, according to her campaign — but it nonetheless represented one of the most comprehensive economic policy visions articulated to date by any of the major presidential candidates. Many of Clinton’s themes will sound familiar to anyone who’s been listening to President Obama over the past eight years. She wants to boost incomes for the middle class, raise taxes on the wealthy and make it easier for parents to juggle work and family. But she also highlighted issues that haven’t been as central to Obama’s message, such as encouraging companies to share more of their profits with workers. Clinton wasn’t shy about criticizing leading Republican candidates, calling out Jeb Bush, Scott Walker and Marco Rubio by name. Notably absent from her speech, however, was any reference to her opponents for the Democratic nomination, including Vermont Sen. Bernie Sanders and former Maryland Gov. Martin O’Malley. But Clinton’s focus on inequality and wages, along with her criticism of Wall Street and measured skepticism of free trade agreements, was no doubt partly intended to shore up support among the liberal wing of her party. Previous generations of Americans built the greatest economy and strongest middle class the world has ever known on the promise of a basic bargain: If you work hard and do your part, you should be able to get ahead. And when you get ahead, America gets ahead. But over the past several decades, that bargain has eroded. The core of Clinton’s message is that middle-class incomes have stagnated in recent years, not just during the recession and its aftermath but even during better economic times. That’s true, though the middle class’s struggles are sometimes exaggerated. The typical (median) U.S. household earned just less than $52,000 before taxes in 2013, the latest year for which full data is available. Adjusting for inflation, that’s less than in 1989, suggesting that the middle class has experienced two and a half decades of income stagnation. Reality isn’t quite that grim. The Census Bureau’s income statistics don’t account for the fact that the typical American household is smaller today than it was 25 years ago. That’s a big deal because a single person living on $50,000 has a much higher standard of living than a family of six trying to squeeze by on the same amount. 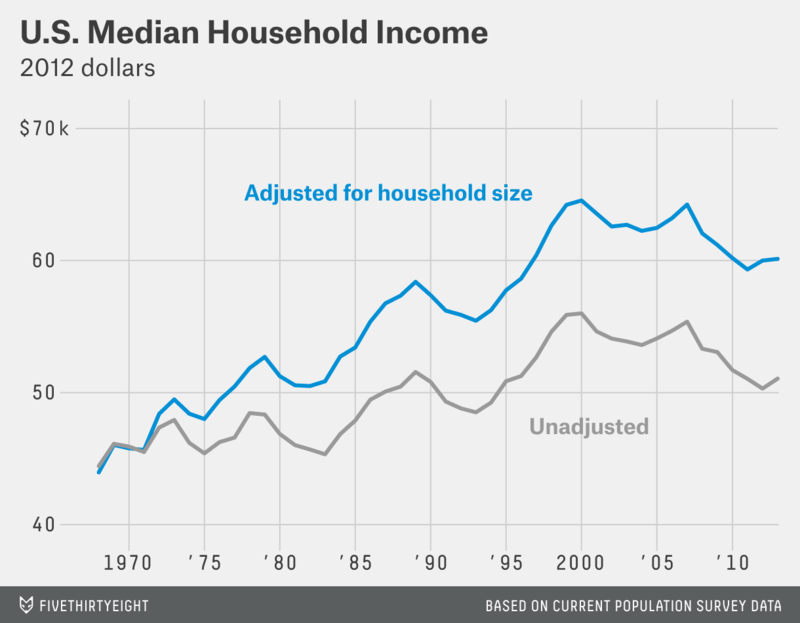 Adjust for household size, and incomes are up significantly since the late 1980s. Even adjusting for household size, however, median income has been more or less stagnant since 2000. Some economists propose other adjustments to the census figures, such as using a different measure of inflation and looking at after-tax rather than pre-tax income. But while the exact figures are in dispute, the overall trend is not: Income growth has been far slower since 2000 than in the decades before. The measure of our success must be how much incomes rise for hard-working families, not just for successful CEOs and money managers and not just some arbitrary growth targets untethered to people’s lives and livelihoods. Clinton didn’t mention him by name until later in her speech, but there’s little doubt this line was intended as a shot at former Florida Gov. Jeb Bush, one of the leading candidates on the Republican side of the campaign. Bush has pledged to deliver a 4 percent annual growth rate, which he has argued is the best way to help the middle class. Clinton says economic growth alone doesn’t necessarily translate into more money for the middle class. There’s evidence to back that up: In recent decades, the share of national income that goes to workers has fallen while the share going to corporate profits has risen. Taken at face value, the numbers mean workers aren’t benefiting as much from economic growth as they used to. Some economists, however, have recently questioned whether workers’ piece of the economic pie has shrunk as much as the official figures show, though they don’t dispute that the so-called labor share fell significantly during the recession. Moreover, even if the long-term decline is real, it has been a global phenomenon, affecting virtually the entire developed world, including many countries with very different economic systems than the U.S.’s. That raises questions about whether Clinton — or any president — could do much to reverse the trend. We also have to invest in our students and our teachers at every level, and in the coming weeks and months, I will lay out specific steps to improve our schools, make college truly affordable and help Americans refinance their student debt. This was nearly the only reference to college in Clinton’s speech, which might seem surprising given her focus on income: For decades, Democrats have stressed expanding access to college as a key way to reduce income inequality and expand the middle class. On an individual level, there’s little doubt that going to college remains the clearest pathway to a good job: The unemployment rate for college graduates was 2.5 percent in June, compared with 5.4 percent for those with only a high school diploma. The typical young bachelor’s degree holder in 2013 earned two-thirds more than the typical high school graduate, and one-third more than the typical worker with an associate degree, according to census data. But while a college education can clearly improve an individual’s job prospects, some economists — including many on the left — argue that education can’t do much to reduce inequality in the country as a whole. As more and more Americans go to college, the supply of college graduates has grown; more than 35 percent of Americans ages 25 to 34 now have at least a bachelor’s degree, up from less than 10 percent 30 years ago. That’s fine as long as employers keep needing more college-educated workers, but recent research suggests that demand for college graduates has leveled off or is even declining. 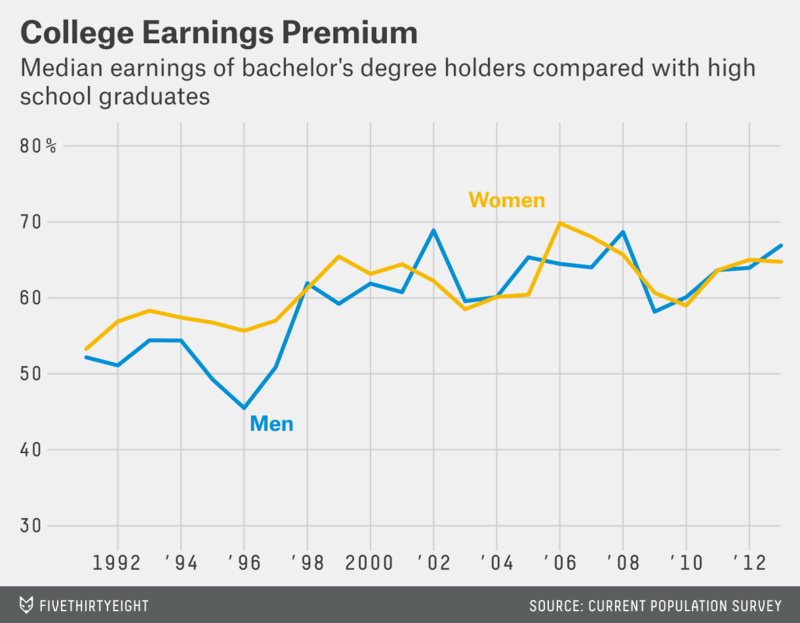 Perhaps as a result, the college-wage premium — how much more college graduates earn than nongraduates — has stopped rising. The movement of women into the American workforce over the past 40 years was responsible for more than $3.5 trillion in economic growth. But that progress has stalled. Another major plank of Clinton’s economic plan is offering families, and working mothers in particular, family-friendly policies like paid parental leave. Compared with most wealthy nations, the U.S. offers workers less paid (and unpaid) parental leave. According to a 2008 analysis by the left-leaning Center for Economic and Policy Research, the U.S. ranks 20th out of 21 wealthy countries in offering two-parent families a combined 24 weeks of unpaid parental leave — and that is only for the 60 percent of workers covered through the Family and Medical Leave Act. Currently, only 12 percent of Americans get paid parental leave through their job, and predictably those benefits are more common for higher-income people. Clinton argued that in addition to promoting fairness, expanding paid parental leave can have serious economic benefits. One way these policies could affect the economy as a whole is by helping to reverse the troubling long-term decline in the share of the population that’s participating in the labor force. The so-called labor force participation rate — the share of the population that’s either working or actively looking for work — has been falling for years and stands at its lowest level since the late 1970s. The decline poses a major economic challenge because it leaves fewer workers to support the nonworking population. The drop has been particularly pronounced among men, whose participation rate has been falling for decades. But just as important has been the leveling off and then eventual decline in participation among women. 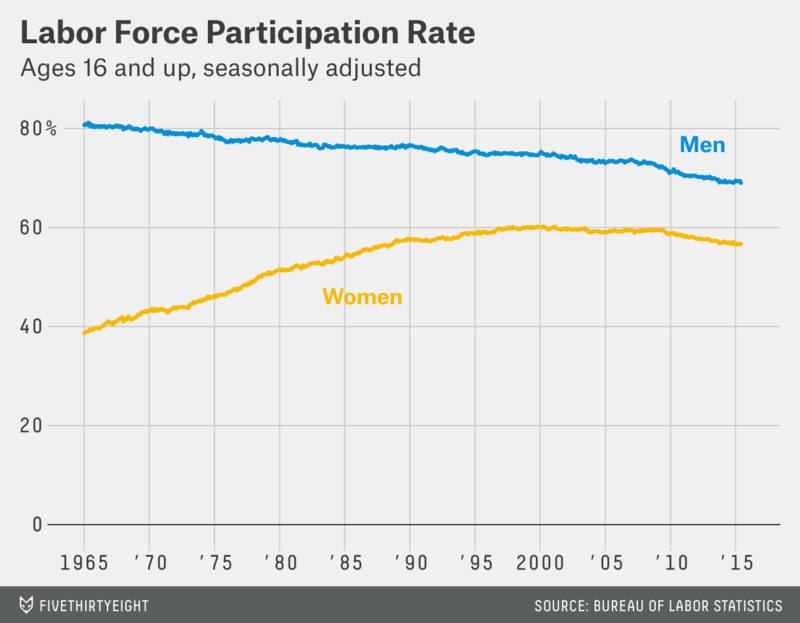 Female labor force participation peaked at about 60 percent in 2000 and has been falling ever since. The U.S., which once had one of the highest female labor force participation rates in the world, according to data from the OECD, now ranks below Latvia, Estonia, Slovenia and a bunch of other countries. Liberal economists, including those on Clinton’s team, have long argued that the U.S. could help more women work if it offered more generous family benefits. Research estimates that the U.S.’s stingier parental leave policies explain about 30 percent of its relatively low female labor-force participation rate. Some states have already instituted family-friendly policies similar to those outlined in Clinton’s speech. California, Rhode Island and New Jersey fund insurance programs that provide four to six weeks of paid family care leave. Advocates for paid parental leave policies also cite other economic benefits, such as reduced employee turnover. Today’s marketplace focuses too much on the short-term, like second-to-second financial trading and quarterly earnings reports, and too little on long-term investments. Clinton sketched out several ideas for reforming corporate America. She advocated for profit-sharing policies, which offer workers an ownership piece in the company they work for, with the goal to boost worker productivity and to distribute the company’s stock gains more evenly. Clinton said “studies show that profit sharing that gives everyone a stake in the company’s success can boost productivity and put money directly into employees’ pockets.” In a speech later this week in New Hampshire, she will have more to say on this issue. Clinton also decried “quarterly capitalism,” or the short-termism of corporate America. Citing the declining rates of business investment in things like factories and research labs and the explosion of share buybacks and dividends, she pledged to better align corporate decisions for long-term growth. But she didn’t say how she would do that. Some potential policies can be found in a report published by the left-leaning (and Clinton-allied) Center for American Progress earlier this year. To encourage more long-term thinking by executives, the report proposed lengthening the time before executive stock options are fully vested, and limiting how many options executives can exercise. Clinton suggested other reforms that would affect corporate America, including the Buffett rule — named after billionaire Warren Buffett — that would institute a minimum tax of 30 percent on those making more than $1 million a year. She also proposed closing the carried-interest loophole, which allows those who make a bulk of their income from capital gains (such as hedge fund managers) to pay a lower overall tax rate. Small businesses create more than 60 percent of new American jobs on net, so they have to be a top priority. I’ve said I want to be the small-business president, and I mean it. And throughout this campaign, I’m going to be talking about how we empower entrepreneurs with less red tape, easier access to capital, tax relief and simplification. Politicians love to talk about the importance of small businesses, but economic research has found that the real drivers of job growth aren’t small businesses but new businesses: Fast-growing startups account for a disproportionate share of hiring. New companies are also key sources of innovation and productivity gains. 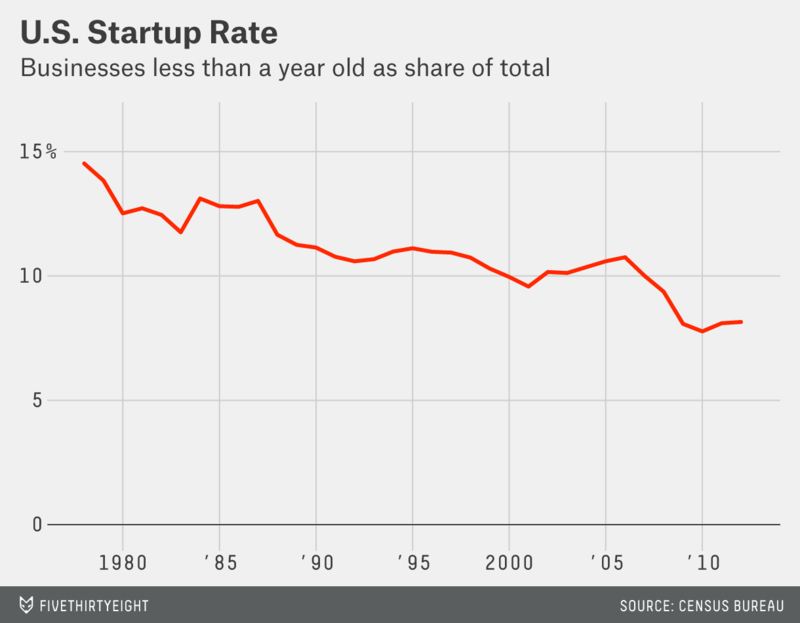 But entrepreneurship in the U.S. is in trouble. The rate at which Americans start new businesses has been falling for 30 years, a decline that cuts across industries and geographies. The trend may be surprising given the buzz around Uber, Airbnb and other high-profile Silicon Valley startups. But for all the talk of “disruption,” data from multiple sources suggests that the American economy has become more comfortable for big incumbent businesses and less hospitable to entrepreneurs. Clinton’s pledge to cut red tape and provide easier access to capital could just as easily have come from a speech from one of her Republican opponents. But the truth is economists aren’t sure what’s behind the decline in startups, which makes it hard to develop policies to combat it. Talent is universal; you find it everywhere. But opportunity is not. There are nearly 6 million young people aged 16 to 24 in America today who are not in school or at work. The numbers for young people of color are particularly staggering. A quarter of young black men and nearly 15 percent of all Latino youth cannot find a job. Clinton’s decision to highlight young people who are neither working nor in school is notable because it’s an economic measure that tends to get relatively little attention in the U.S. In Europe, the concept is so widely discussed that even mainstream news outlets routinely refer to “NEETs,” short for “not in employment, education or training.” In some European countries such as Greece and Italy, more than 30 percent of people ages 20 to 24 are NEETs. The problem isn’t nearly as severe in the U.S., but it is still significant. Nearly 19 percent of American 20- to 24-year-olds were neither working nor in school in 2013, according to OECD data. 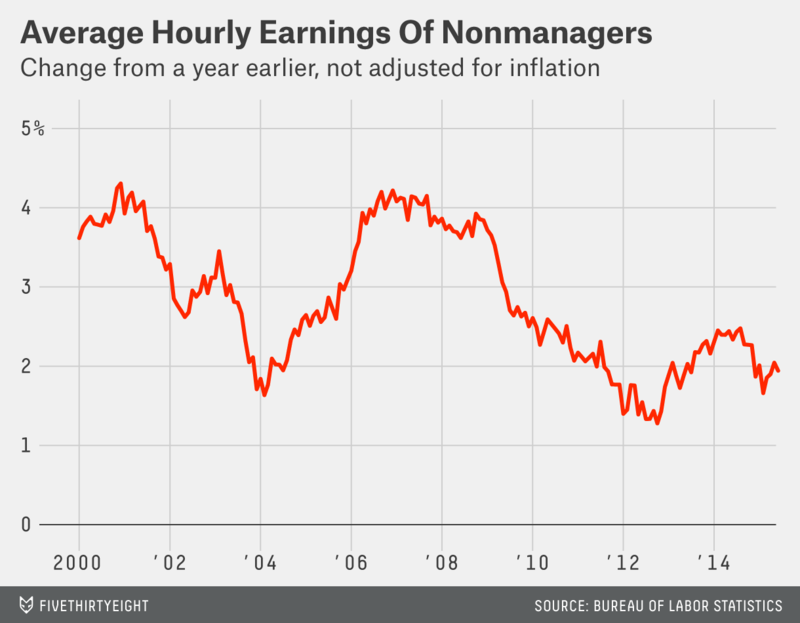 That’s little better than in the worst of the recession and is up from 15.5 percent in 2005. And as Clinton said, the numbers are far worse for many minority groups. OECD doesn’t break down its data by race, but according to data from the Bureau of Labor Statistics, 22 percent of black men ages 16 to 24 are neither in school nor working, compared with 16 percent of all Americans in that age group.